The Assassination of the Presidents and the Beginning of the "Apocalypse"
As the killing intensified, the international community deserted Rwanda. Western nations landed troops in Rwanda or Burundi in the first week to evacuate their citizens, did so, and left. The UN mission (UNAMIR), created in October 1993 to keep the peace and assist the governmental transition in Rwanda, sought to intervene between the killers and civilians. It also tried to mediate between the RPF and the Rwandan army after the RPF struck from Rwanda to protect Tutsi and rescue their battalion encamped in Kigali as part of the Accord. On April 21, 1994, the United Nations Security Council, at the behest of the United States—which had no troops in Rwanda—Belgium, and others, voted to withdraw all but a remnant of UNAMIR. The Security Council took this vote and others concerning Rwanda even as the representative of the genocidal regime sat amongst them as a non-permanent member. After human rights, media, and diplomatic reports of the carnage mounted, the UN met and debated and finally arrived at a compromise response on May 16. UNAMIR II, as it was to be known, would be a more robust force of 5,500 troops. Again, however, the world failed to deliver, as the full complement of troops and materiel would not arrive in Rwanda until months after the genocide ended. Faced with the UN’s delay, but also concerned about its image as a former patron and arms supplier of the Habyarimana regime, France announced on June 15 that it would intervene to stop the killing. In a June 22 vote, the UN Security Council gave its blessing to this intervention; that same day, French troops entered Rwanda from Zaire. While intending a wider intervention, confronted with the RPF’s rapid advance across Rwanda, the French set up a “humanitarian zone” in the southwest corner of Rwanda. Their intervention succeeded in saving tens of thousands of Tutsi lives; it also facilitated the safe exit of many of the genocide’s plotters, who were allies of the French. On July 4, the RPF took the capital, Kigali; two weeks later, it announced a new government comprised of RPF leaders and ministers previously selected for the transition government called for in the Arusha Accord. With the RPF’s takeover, and with the encouragement of extremist radio, Rwandans implicated in the slaughter, their relatives and those who feared the arrival of the RPF, fled to neighboring countries. In the end, the extremists killed nearly one million Rwandans, approximately one-tenth of the population. Were it not for the RPF’s military prowess, the genocide would have continued. Despite overwhelming evidence of genocide and knowledge as to its perpetrators, United States officials decided against taking a leading role in confronting the slaughter in Rwanda. Rather, US officials confined themselves to public statements, diplomatic demarches, initiatives for a ceasefire, and attempts to contact both the interim government perpetrating the killing and the RPF. The US did use its influence, however, at the United Nations, but did so to discourage a robust UN response (Document 4 and Document 13). In late July, however, with the evidence of genocide littering the ground in Rwanda, the US did launch substantial operations—again, in a supporting role—to assist humanitarian relief efforts for those displaced by the genocide. Facsimile from Maj. Gen. Romeo Dallaire, Force Commander, United Nations Assistance Mission for Rwanda, to Maj. Gen. Maurice Baril, United Nations Department of Peacekeeping Operations, “Request for Protection for Informant”, January 11, 1994. In this notorious “genocide fax” (originally published in The New Yorker), Gen. Dallaire warns UN peacekeeping officials—Maj. Gen. Maurice Baril, the military adviser to Secretary General Boutros Boutros-Ghali, and Kofi Annan, who at the time was Under Secretary General for PKO (peacekeeping operations) and is now UN Secretary General—of the existence of arms caches, a plot to assassinate Belgian UN peacekeepers and Rwandan members of parliament, and the existence of lists of Tutsis to be killed. Dallaire informs New York of his intention to raid the caches, but foreshadowing later developments, Annan and DPKO official Iqbal Riza refuse the request, citing UNAMIR’s limited mandate. Instead, they order Dallaire to apprise the president of Rwanda of the informant’s allegations, despite the fact that the arms caches and assassination plan are the work of those close to the president. On April 7, the day after the shoot down of the President’s plane, members of the Presidential Guard carry out this plan, torturing, killing, and mutilating 10 Belgian soldiers in the UN contingent protecting the Prime Minister, who was also their target. As foreseen by the plan’s authors, Belgium quickly withdrew their contingent from UNAMIR, breaking the backbone of the force. Within two weeks, the UN Security Council voted to reduce UNAMIR to a token presence, removing the last impediment to the slaughter. Bushnell, the State Department’s number two official for Africa matters, who would lead the State Department’s initial day-to-day efforts during the genocide, advises Secretary of State Warren Christopher of the assassination of Rwandan president Habyarimana and Burundian president Ntaryamira. Bushnell alerts Christopher that “widespread violence” is likely upon the death of the president. Ominously, she reports that “the military intend(s) to take over power temporarily”, and that they are “very resistant to working with the current (interim) Prime Minister”. Indeed, the Prime Minister, Agathe Uwilingiyama, a member of the opposition MDR party, will be assassinated by members of the Presidential Guard the following day. Memorandum from Deputy Assistant Secretary of Defense for Middle East/Africa, through Assistant Secretary of Defense for International Security Affairs, to Under Secretary of Defense for Policy, “Talking Points On Rwanda/Burundi”, April 11, 1994. Confidential. This document—apparently produced as a briefer for a dinner between Under Secretary Frank Wisner, the third ranking official at the Pentagon, and former Secretary of State Henry Kissinger—shows the Pentagon’s candid assessment about events in Rwanda only five days after the shoot down of the Rwandan president’s plane. Pentagon Africa analysts conclude: if the peace process fails, “a massive bloodbath (hundreds of thousands of deaths) will ensue”; the “UN will likely withdraw all forces”; and the US will not get involved “until peace is restored”. That these shocking details are offered as dinner conversation reveals the extent to which Pentagon analysts accepted it as inevitable. US Department of State, cable number 099440, to US Mission to the United Nations, New York, “Talking Points for UNAMIR Withdrawal”, April 15, 1994. Confidential. This telegram forwards Department of State guidance to the US Mission to the UN in New York instructing US diplomats there that “the international community must give highest priority to full, orderly withdrawal of all UNAMIR personnel as soon as possible.” Advising that this withdrawal does not require a UN Security Council resolution—which would have likely focused international criticism—the Department instructs the mission “that we will oppose any effort at this time to preserve a UNAMIR presence in Rwanda.” April 15 was the first of two days of UN Security Council debate on next steps in Rwanda—for which the Rwandan ambassador was present and about which he reported back to the interim government in Rwanda. Over that same weekend, aware the UN Security Council was in retreat, the interim Council of Ministers, the genocide’s architects, met in Kigali and decided to take the program of extermination to the rest of the country. Press Release, Office of the Press Secretary, The White House, “Statement by the Press Secretary”, April 22, 1994. Non-classified. Many consider this statement by the White House—done at the urging of Human Rights Watch—as the penultimate US initiative during the genocide. In naming and calling on four Rwandan military leaders to “end the violence”, it is probably the sole example of high-level attention—however brief—trained on officials involved in the genocide. Discussion Paper, Office of the Deputy Assistant Secretary of Defense for Middle East/Africa Region, Department of Defense, May 1, 1994. Secret. A product of an intra-agency process comprised of working level Pentagon action officers with expertise in African affairs, humanitarian and refugee affairs, public affairs, and special operations, and also officials of the Joint Staff’s Strategic Plans and Policy division, this memo for the record provides an inside glimpse at the various goals, options and tactics discussed at a meeting of officials charged with day-to-day responsibility for the Rwanda crisis. It is filled with cautions against the US becoming committed to action. Genocide comes up in the discussion: “Be Careful. Legal at State was worried about this yesterday—Genocide finding could commit USG to “do something”. US Department of State, cable number 113672, to US Embassy Bujumbura and US Embassy Dar es Salaam, “DAS Bushnell Tells Col. Bagosora to Stop the Killings”, April 29, 1994. Limited Official Use. State Department officials at the working level contacted Rwandan officials regularly to urge an end to the killing—to little effect. In this cable, Deputy Assistant Secretary of State for African Affairs Prudence Bushnell challenges Col. Theoneste Bagosora, cabinet director in Rwanda’s Ministry of Defense and the coordinator of the genocide, as to who is responsible for the massacres. Ironically, his call for a cease-fire echoes the US call for the same, albeit for very different reasons. The telegram also highlights the US government’s pre-occupation with returning to a “peace process”, when much of Rwanda is littered with corpses. Memorandum for the Vice President, et. al., “PDD 25: U.S. Policy on Reforming Multilateral Peace Operations”, May 3, 1994. Confidential with Secret attachment. White paper, Department of State, “The Clinton Administration’s Policy on Reforming Multilateral Peace Operations”, May 1994. Non-classified. Presidential Decision Directive 25 guides US government policy on peacekeeping operations, setting forth criteria that must be met before US participation can occur. The document stipulates three different sets of criteria depending on the anticipated level of engagement. One of the most controversial policy documents of the Clinton Administration’s first term, this directive was under development for more than a year, and during the review was the subject of bureaucratic infighting, leaks to the press, and strong Congressional criticism. While much information in the directive itself remains classified, the State Department issued an executive summary as a “white paper”, which spells out the thresholds and criteria for US involvement in peace operations. Memorandum from Under Secretary of Defense for Policy to Deputy Assistant to the President for National Security, National Security Council, “Rwanda: Jamming Civilian Radio Broadcasts”, May 5, 1994. Confidential. As the carnage continued and a robust response by the US or others was not forthcoming, human rights groups, members of Congress, and others urged the Clinton Administration to counter or “jam” extremist radio broadcasts in Rwanda. These broadcasts spread fear amongst the Rwandan populace, urged participation in the killing, shamed those who sought not to participate, and in many cases, specifically named and provided the whereabouts of those to be killed. As such, the radio broadcasts were essential to the fulfillment of the program of extermination. In this memo, Frank Wisner, the number three official at the Pentagon, acknowledges internal discussions about the feasibility of countering the hate radio. He replies to Sandy Berger, the deputy to National Security Adviser Tony Lake, that undertaking the initiative to “jam” the radio would be “ineffective and expensive”; a “wiser” activity would be to assist the “relief effort”. Defense Intelligence Report, Defense Intelligence Agency, “Rwanda: The Rwandan Patriotic Front’s Offensive”, May 9, 1994. Secret/NOFORN (not releasable to foreign nationals). Produced one month into the genocide, this report declares that “Almost immediately after President Habyarimana was killed, in Kigali the Presidential Guard began the systematic execution of prominent Tutsi and moderate Hutu” and that the violence is “directed by high-level officials within the interim government”. 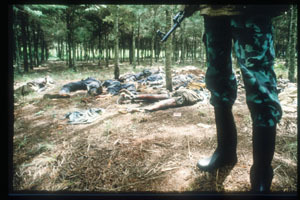 It identifies the army as pursuing a “genocide …to destroy the leadership of the Tutsi community.” In contrast to many of the public statements of US officials at the time, this analysis shows that the government did discern between the planned slaughter of civilians and the renewed warfare between the Rwandan armed forces and the rebel RPF. Memorandum of Conversation, Office of the Deputy Assistant Secretary of Defense for Middle East/Africa Region, Department of Defense, “Rwanda Interagency Telecon”, drafted by Lt. Col. Michael Harvin, circa May 11, 1994. Secret. This memorandum serves as a vivid account of the differing perspectives and postures of the players engaged in the response to the crisis in Rwanda, complete with exclamation marks indicating the memo drafter’s incredulity at a participant’s remarks. The interagency teleconference on Rwanda occurred daily, serving an information exchange function and an option vetting function. Attending from the Pentagon side at this meeting are officials from the Middle East/Africa office, the peacekeeping/peace enforcement office, and the office of the Assistant Secretary for Special Operations & Low Intensity Conflict, in addition to military members of the Joint Staff. This report demonstrates the gulf between the views of the State Department and National Security Council officials and the views of Pentagon and military officials: “the meeting degenerated into a NSC/State attempt to sign-up the Principals to support a Chapter VII operation wearing Chapter VI sheep’s clothing, with OSD and Joint Staff in stiff opposition.” In translation, this refers to NSC and State representatives’ efforts to persuade senior Pentagon officials and the Joint Chiefs of Staff to agree to “peace enforcement” (read possible combat operations) in Rwanda, rather than waiting in vain for a ceasefire that will not come in order to do “peacekeeping”. US Department of State, cable number 127262, to US Mission to the United Nations, New York, “Rwanda: Security Council Discussions”, May 13, 1994. Confidential. Under Secretary of State for Political Affairs Peter Tarnoff and senior officials, including the Director of the Joint Staff, drafted and approved this cable delivering instructions to the US Mission in New York for Security Council debate over replenishing UNAMIR. With much of the killing completed and most of the remaining armed forces fleeing the RPF’s countrywide advance, US officials argue against a UN plan for a robust effort launched into Kigali to protect surviving Rwandans, rescue others, and deliver assistance. Such a plan, “in current circumstances, would require a Chapter VII mandate”, and the US “is not prepared at this point to lift heavy equipment and troops into Kigali”. It is however, willing to consider its own plan, “outside-in”, by which protective zones would be established on Rwanda’s borders. Even this plan, however, is likely to be “an active protection operation requiring the use of lethal force.” As for the several thousand Rwandans in Kigali under deteriorating UN protection, “we recommend that these ad hoc protective efforts should continue until a suitable alternative arrangement can be ensured.” Even when a plan for 5,500 troops with a protection mandate is finally approved on May 17, the troops would not all be in place until September, two months after the RPF captures the country and one month after Gen. Dallaire completed his service in Rwanda. Action memorandum from Assistant Secretary of State for African Affairs George E. Moose, Assistant Secretary of State for Democracy, Human Rights and Labor John Shattuck, Assistant Secretary of State for International Organization Affairs Douglas J. Bennet, and Department of State Legal Adviser Conrad K. Harper, through Under Secretary of State for Political Affairs Peter Tarnoff and Under Secretary of State for Global Affairs Tim Wirth, to Secretary of State Warren Christopher, “Has Genocide Occurred in Rwanda?”, May 21, 1994. Secret. The internal debate over whether genocide was occurring in Rwanda in 1994 and US officials’ use of the term began nearly as soon as the killing began. Nevertheless, Department of State officials refrained from characterizing it as such for weeks. While on June 10 Secretary of State Warren Christopher finally publicly called the Rwandan slaughter “genocide”, on May 21 he had authorized Department officials—“in light of the stark facts in Rwanda”—to use the formulation “acts of genocide have occurred” and authorized delegations to agree to resolutions using various formulations of the term. The memo argues for consistency with the use of the term with relation to Bosnia. A previous memo dated May 16, sought approval to use the term “genocide has occurred”, but this formulation didn’t hold. Interestingly, the principal officials here find no legal obligation in the use of either formulation; but in avoiding use of the “genocide label”, US “credibility will be undermined with human rights groups and the general public”. Memorandum from Assistant Secretary for Intelligence and Research Toby T. Gati to Assistant Secretary of State for African Affairs George Moose and Department of State Legal Adviser Conrad Harper, “Rwanda – Geneva Convention Violations”, circa May 18, 1994. Secret/ORCON (originator controlled). This intelligence analysis, prepared for Secretary Christopher’s decision as to use of the genocide label, finds “substantial, circumstantial evidence implicating senior Rwandan government and military officials in the widespread, systematic killing” of Tutsis and moderate Hutus. The RPF, “unlike government forces”, “does not appear to have committed Geneva Convention defined genocidal atrocities.” The analysts report that between “200,000 to 500,000” are dead. It also finds it credible that “Hutu elements in the military” “killed Habyarimana in order to block” the power-sharing Arusha Accords and “eliminate the Tutsi-dominated RPF and sympathetic Hutus”. Draft Legal Analysis, Office of the Legal Adviser, Department of State, drafted by Assistant Legal Adviser for African Affairs Joan Donoghue, May 16, 1994. Secret. This legal analysis, like the preceding intelligence analysis, was prepared for Secretary of State Christopher’s decision concerning the public use of the term “genocide” to describe events in Rwanda. In analyzing the applicability of definitions from the Genocide Convention of 1948 to the events in Rwanda, the assistant legal adviser finds that there is “little question” that genocidal acts have occurred in Rwanda; finds that “most of those killed in Rwanda have been Tutsi civilians”; and finds that “acts have apparently been committed with the requisite intent to destroy, in whole or in part, the Tutsi group”. She also argues that ascertaining an accurate figure for numbers of deaths “is not critical to this analysis” that genocide has occurred.